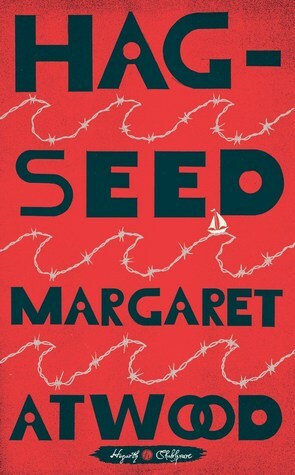 Hag-Seed by Margaret Atwood. Hogarth Shakespeare, 2016. Ebook. 256 pages. Margaret Atwood is an incredibly intelligent, adept, and inspirational woman that has written countless incredible works and continues to do so with her newest release, Hag-Seed. Hag-Seed is part of Hogarth Shakespeare's project to have a variety of bestselling authors retell many of Shakespeare's most classic works. I am really excited about this project, and I think it is an exciting way to bring Shakespeare's work to life in new and imaginative ways. I honestly feel like I don't even know where to start with this magnificent book. I am not overly familiar with The Tempest itself (I vaguely remember reading it years ago, maybe it's time to re-read), so I understand that I may not have understand every reference or interpretative view, but I understood the basics and the fact that this book is outstanding. I sincerely enjoyed this book and breezed right through - though that is not to say that this was a lighthearted read. Hag-Seed is filled with so many layers, all of which add a greater level of depth to the story. I loved the entire setting. I thought the entire prison literature program that Felix was in charge of was brilliant. Having the prisoners partake in a play retelling Shakespeare plays? It doesn't get more interesting or better than that. I enjoyed seeing the different ways in which the prisoners got excited and how they manifested their eagerness for the play. Atwood once again creates remarkably intriguing characters. He's not exactly a lovable man, but there is something about him that draws you in and makes you want to follow his story. At heart, he is a man still struggling deeply to overcome the death of his daughter and the loss of his job - his whole life. He is looking for a way to begin and for a way to enact revenge upon those who helped to ruin his life. He is careful and unassuming, the perfect role for his own personal play. The other characters were also extremely fun to dissect and learn about, and Atwood brought each one to life with a vibrant, unique personality. I particularly enjoyed Anne-Marie's character, who is the woman Felix hires to play the role of Miranda, which turns out to be an exceptionally important role to Felix. This isn't a comedy, but there is an abundance of comic relief - both overt and subtle - that truly made this book a joy to read. Everything in this book is brilliant and only further enforces the fact that Atwood is a genius. The plot of this story centers on Felix's play, which the play itself then sets the stage and becomes a plan for revenge. Felix himself is the character he plays - both in his own life and the play. This book is so subtle in its meta qualities. Hag-Seed is a retelling, but it also retells the basic play itself. Through the prisoners we are able to truly study the characters of the play: their motivations, personalities, ideas, and so much more. Overall, I will be giving Hag-Seed four stars!